Safe digging is everyone’s responsibility…and it begins with you! 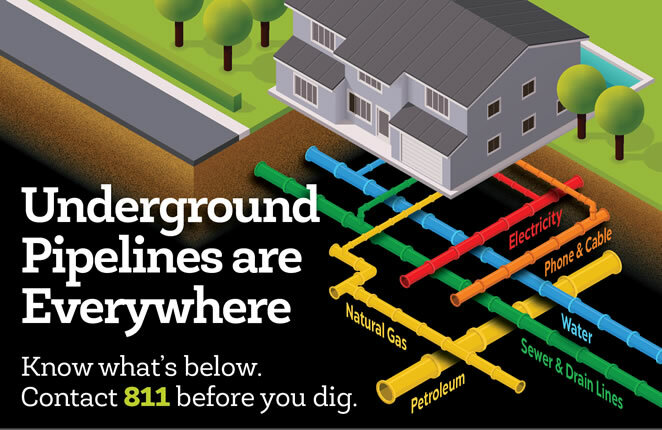 Safe digging starts when you call Georgia 811. By law, everyone-including homeowners-must contact Georgia 811 by dialing 811 or 1-800-282-7411 at least 48 hours before beginning any mechanized digging on your property. If you are unsure as to whether you should notify Georgia 811 before you break ground, remember, even if your digging project is small, its always best to call! The Georgia Utility Facility Protection Act (GUFPA) was established to protect the underground utility infrastructure of Georgia. Your familiarity and adherence to this law is extremely important in assuring the safety of our underground facilities and the general public. The GUFPA mandates that, before starting any mechanized digging, or excavation work, you must contact Georgia 811 at least 48 hours but no more than 10 working days in advance to have utility lines marked.